Pickled onions are a traditional English favourite, eaten as a tangy condiment alongside cheese and crackers, meat, fish, egg or cheese sandwiches and savory meat pies. Pickled onions are also a necessary staple of the pub-style ploughman’s lunch. I’ve personally tried many of these recipes, in search of the perfect pickled onion reminescent of the ones I remember eating as a child in England. My mother used to put up jars of pickled onions and pickled red cabbage in the autumn, so both would have time to age before the Christmas holidays. Upon opening the jars (usually on Christmas Eve), she would taste the wares and declare them acceptable (or not) depending on how much they tasted like the pickled onions that her own mother used to make. So there you go – that’s the tradition of English pickled onions in our family, and in many other families around the world. (mine is the 1992 edition) with one from a Jackson Cooker recipe book from the 1950’s, which is the recipe my mother followed. This video will show you how to make a single jar of traditional pickled onions. The onions are peeled and placed in a jar of water, to which a little sugar is added. After sitting overnight, the sugar water is poured off, then replaced with malt vinegar and pickling spice. The modern recipe for Bernardin Pickled Onions calls for processing the jars for ten minutes in boiling water. I chose not to follow this step, as the hot-water bath processing tends to soften the onions and ruins the crisp crunch of the perfect pickled onion. However, the question of whether to process or not process pickled onions is frequently debated on recipe forums and blogs. Hot water bath processing is no doubt safer to some degree, so only you can decide whether you want to trust old-fashioned preserving methods which skip hot water bath canning. Older recipes rely instead on vinegar of at least 5% acidity, along with sterile bottling techniques and properly sealed jars. You and family or friends will be eating the product you make, so only you can decide what is right for you. If you want to hot process your onions, follow the directions below, seal with two-part lids as soon as you’ve added the hot vinegar, then process for 10 minutes in a boiling water bath. Paring knife, large stainless steel saucepan, canning jars with two-part snap lids and screw bands, canning tongs, wide-mouth canning funnel, flexible narrow spatula, measuring cups and spoons, oven, tea towel. This amount should make five to six pints (five or six 2-cup mason jars) depending on the size and number of onions that you can pack in each jar. To be sure, peel the onions and place them into the jars to get an accurate jar count. Cover the onions with water, then pour off the water and measure it to determine the amount of vinegar needed. Peel the onions. I used a sharp paring knife, snipping the root and tip ends off each onion, then peeling off the top skin and the papery underskin, until I had a clean white peeled onion. The skins may peel away faster if you blanch the onions for one minute in boiling water, then chill with cold water and proceed as above. Place peeled onions in a stainless steel, glass or enamel bowl and sprinkle with pickling salt. Cover and leave overnight, stirring a few times to distribute the salt and salt water that accumulates at the bottom of the pan back over the onions. Wash jars in soapy water, rinse, dry, then place jars in the oven at 225 degrees. Leave in the oven at this temperature for at least 20 minutes to sterilize prior to filling. Use two-part canning lids, with center snap lids and screw bands, to seal the jars. When you are nearly ready to fill the jars, add the center snap lids to a small saucepan of simmering hot water for five minutes to sterilize and soften the sealing compound (or follow manufacturer’s directions). Rinse salted onions well and pat dry with a clean towel. Place vinegar, pickling spice, and sugar in a large stainless steel saucepan and bring to a boil. Boil for three to four minutes, then add onions. Bring spiced vinegar and onions back to a boil. Remove hot jars from the oven with canning tongs. Pack onions into the jars, pushing down on some of the onions, if necessary, to get them to fit snugly. Use the canning funnel to cover the onions with spiced vinegar, making sure some of the spices get into each jar. Fill to within 1/2 inch from jar rim. Run a rubber or silicone spatula down into the jar to dislodge any air pockets and top with more spiced vinegar, if necessary, to maintain 1/2 inch head space. Wipe jar rims clean. Center a snap lid on the first jar, then screw down the metal band until fingertip tight. Wait for jars to cool overnight, then check seals. The center of the lids should be slightly depressed and should not flex when pressed. Remove the screw bands and lift each jar by the lid. If the lid is vacuum sealed, it should not move at all. You can loosely replace the screw bands or leave them off at this point. Label and store your jars of English pickled onions in a cool, dark place. Although I’ve always been told to let pickled onions “age” for at least two months, I had a partially filled jar that I couldn’t seal, so I put that one in the fridge. I sampled the first pickled onion after two days and it was perfect, with a crisp, slightly crunchy texture and deliciously tangy spiced flavour. It was a beautiful clean white colour, which should darken to a lovely spiced brown by the holiday season. Properly sealed and stored, your English pickled onions should keep their high quality taste and texture for one year or more. Pub Style Onions from Food.com. I enjoyed your article on ‘English Picked Onions’ until I got to the recipe ingredients…why on earth are you adding a cup of white or brown sugar…totally unnecessary and unhealthy! 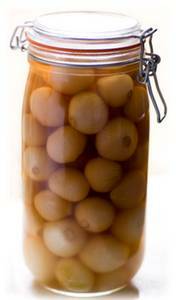 The amount used amounts to about 2 tablespoons per quart and is a frequent addition to recipes for pickled onions. I believe it helps with the crispness, and I love the tangy, vinegary, just-spiced-right combination in this recipe, which is as close as I can get to pub-style English pickled onions. Thank you for the fabulous recipe!..Both my mother and grandmother used to make them this way (sadly I couldn’t remember my Mums recipe,neither could she)..but definitely all malt vinegar,and unlike some recipes,pickling onions,not pearl onions,and when you have high acidity in foods,a water bath isn’t really necessary,as my Mum never did,and I’m still around 56 years later!..Thank you again!! I’m so glad you like the recipe! Enjoy – this recipe really is just like grandmother used to make, at least in my opinion. Thanks for your feedback! I have followed this recipe to a t for two years. 30 jars later I’m not sure why shelf life is a concern, I’ve had to make two batches this year just to ensure I have enough for Christmas! And I’m more North American than English because I do half and half the vinager. However even my English friends say they are pub worthy. Thanks for a great recipe!!!! I’m thrilled with this feedback, Julie. Your experience is similar to mine but it’s so nice to get that confirmed. Thank you, and have a Happy Christmas! If they aren’t hot water bathed, then they probably should be stored in the fridge, rather than shelf-stored, to meet modern North American safety standards. Food safety is always priority 1, 2 and 3.